The Chaff | A personal journey from consumerism to minimalism. Things around my house have been a bit chaotic, but in a good way. In August we welcomed the birth of our son. He’s a wonderful blessing, and having a baby around the house has brought with it some interesting challenges on my minimalist path. Namely, babies require more things around the house (for the time being). A newborn also adds some complexity until routines are established, especially with other children in the home. Toys don’t get picked up as often. Rooms don’t stay as clean. And, the regular stream of stuff leaving the house has diminished to a trickle. It would be easy to think that this could turn into a time of frustration since it’s hampered my ability to downsize. Instead, I’ve taken the approach of using this time to appreciate my son, spend time with him, my girls, and my wife, and to know that I’ll be back in the swing of things before too long. And as he gets older, more baby things will be leaving the house for good. I’m thankful for what I have accomplished to this point, because I’d be much further behind had I not started yet. As part of my journey to give things away, I’m pressing pause and allowing myself to give up the need to keep pushing so hard to minimize. Now is a time for special moments. Things will be messy, for awhile. Life will be chaos, for awhile. Sleep will be minimal, for awhile. And that is quite alright. This entry was posted in Thoughts on November 5, 2014 by ericjgruber. If the stuff in your house just ends up in the trash, why have it in the first place? My cul-de-sac has seen a flurry of activity in the past week. There are two really busy times of year for people in a college town like mine. The end of May is when a lot of the students move out, and near the beginning of August is when a lot of students move in. It’s obviously not a one-for-one scenario, but those two times are usually quite active with people moving in and out of their rentals and finding new ones, either in town or somewhere else. The trash pickup in my area is early on Wednesday morning. For whatever reason, some of the people moving out in the neighborhood didn’t get everything they were discarding out until after that. One of the things I like about where I live is the view from my bedroom looking out the window. But since last Wednesday afternoon, I’ve had to look across the street to see a pile of junk that didn’t make it out in time for trash pickup. It’s an eyesore to look at, but it gave me something to think about. 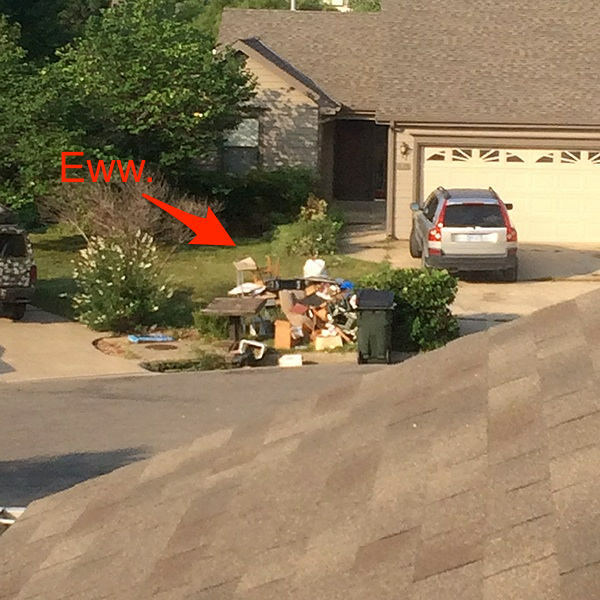 Seeing these piles of junk left behind really gives perspective to the people living there. Why did they have things in their home they eventually decided was trash? What value did those items left behind give them when it was in their home? Will they think differently about their possessions at their next dwelling, or will this cycle of consumption continue? Putting yourself in the “I could move from here someday” mindset might be helpful when you’re taking stock of what you own. We know that we’ll be moving from here before too long. It might be a year, it could be two, but we definitely know this isn’t a long-term domicile for us. That mindset has been helpful for us as we continue our path toward minimalism. The thought that we’re going to move helps us to decide what things we should keep now, rather than deal with it at a less opportune time in the future. I’ve had many people tell me, “When we moved, we got rid of so many things.” Therein lies the problem. If we end up getting rid of things when we move, then why do we have them at all? We have a long way to go, but I’m thankful we’re edging toward the mindset of only having things in our home that we value. And perhaps, if we’re diligent, we won’t have many things at the curb when we’re ready to move on to the next place. This entry was posted in Thoughts on August 4, 2014 by ericjgruber. Do possessions bring happiness or the opposite? 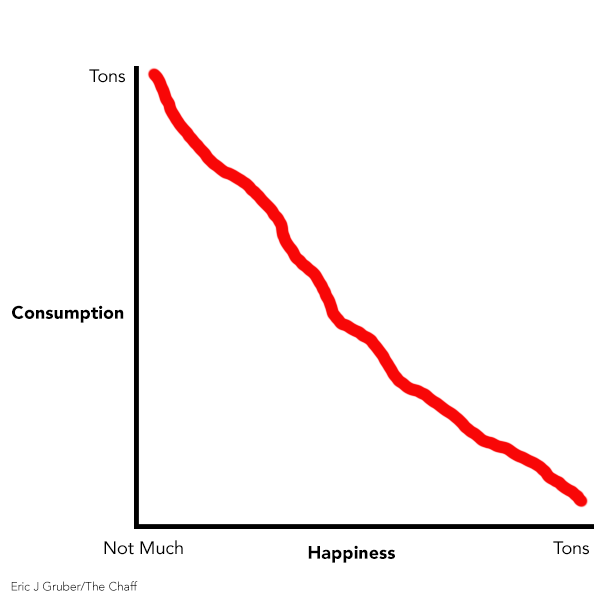 NOTE: Not a scientific chart by any measure, except my own experience to this point. Recently I was in a store killing time while I waited to meet up with someone and I took stock of all the items that were available to purchase. This store wasn’t special. In fact, the most striking thing about it was its lack of speciality. It was a type of general store and offered anything and everything it could get on the shelves in case someone wanted to purchase anything at all. There were many tempting things to purchase, but I left the store buying only one: a package of air fresheners for my automobile. The package cost $2 and I purchased it because I thought it would add value to my traveling life. Most everything else in the store? It was crap — disposable, low value, low priced, crap. As I make this journey to minimalism, I’ve reached a mental state where I start giving a conscious thought to how I spend every dollar. It is starting to shape every buying purchase, and is helping to curb new items from coming into my life that don’t need to be there. I call this state of mind peak consumerism. Our local library recently re-opened after a major renovation. On opening day my wife and I went to check out the new digs. The building is stunning. It’s equipped with video games (presumably for the teens but they might have to fight me for it), video and music rentals, meeting rooms, a small concert hall, books (of course), and even soundproof rooms equipped with computers and recording equipment for those who would like to try their hand at making an audible creation. While walking through the library, I had what should have been an obvious thought: libraries are a minimalist’s best friend. You don’t need to own books, you can rent them for the price of your taxpayer contributions. The more modern libraries (like ours) takes that a step further with even more items you can use without purchasing. Because of this, I’m working on getting rid of the last of my books and the bookshelf along with it. I’ll keep the few books I deem important, read the ones I want to finish before I donate them, and be done with collecting bound trophies. While at a conference earlier this year, I saw a car with a pink mustache attached to its bumper. My curiosity got the best of me, so I approached the driver to ask what it was all about. She was a driver with Lyft, a service where people use their own automobiles to act as a taxi to others for a fee. Other services are getting into this game as well. Uber and Zipcar also offer alternatives to owning a car. In nearby Kansas City, Bike Share KC lets you rent bicycles to ride around the city. I saw a similar service at that same conference where I saw the Lyft car. This summer has been filled with little projects, one of which was building up the foundation of my house with dirt to provide a better grade for water to drain away from the foundation. I found a company to deliver two tons of soil to my house, but I needed a way to move it from the delivery spot in my front yard to various points on my property. I went to the hardware store to purchase a wheelbarrow, but the thought of paying at least $40 for something I’d likely only use once and then need to store it didn’t set well with me. And then I remembered that only a few more blocks away was a place that rented all sorts of tools. I rented a wheelbarrow for the day and didn’t even have to find a place to store it. Total cost to me: $12. There was an age where I put a lot of time into building up my music collection. I made my entire collection digital and donated or sold the CDs, but what was I to do about new music? The library is certainly one option, but recent changes in the music industry has led to another option for those who don’t care to own the files: streaming music. Spotify, Pandora, and Beats Music have made this perfect for someone like me. Movies are no different. Netflix has allowed me to watch movies and TV shows without a single box having to enter my home. Amazon’s Prime Instant Video and Hulu are other options. And if you want to purchase something and can live with the walled garden of DRM’d movies, buying movies for download from Apple, Google, or Amazon are fine alternatives as well. That’s not to say you can do all of this for free. But it certainly can be much cheaper. My Netflix subscription is pennies for what I get and Spotify offers ad-supported listening, for example. But what these new offerings bring us are alternatives to the need to have an abundance of space solely so we can store physical items. If you think about it, that does factor into cost when you consider the price of needing to buy a bigger home or renting a bigger place to accommodate storing your possessions. How many dollars per square foot are you willing to pay to store your movie collection, or in my case, your empty DVD cases? What other changes will peak consumerism bring? I am unsure if peak consumerism will occur on a wide scale. A majority of people love to purchase and own things. But I do think that individuals reach peak consumerism, and that can translate to a trend over time. For example, one thing that has captured my attention recently is the tiny house movement, where people build customized, intentionally small houses. Many cities have building codes that require a minimum size that exceeds what these buildings end up being, so workarounds are made by building the homes on trailer frames and parking them on land somewhere. Of course, to live in a tiny house means you have to sacrifice a lot of your possessions, which turns the occupants into forced (or desired) minimalists. I have some doubts that I could pull it off with a four (soon to be five) member family, but you never know … it’s all about thinking outside the box you’ll be living in. But if peak consumerism becomes more widespread, change will occur. City codes will need to be altered or traditional home ownership will decline. Laws created to favor tax services will need to change to allow companies like Uber and Lyft to operate legally in some areas. But ultimately, the buyer has the power to simply say, “no.” Consumption is not the only option. We can choose to resist the urge to mindlessly consume and instead be thoughtful about each and every purchase. We can achieve peak consumerism as individuals, or we can reach it en masse, but I believe a sea change is happening. This entry was posted in Thoughts on July 31, 2014 by ericjgruber. Four bins of recycled materials and three bags of trash. Not too bad for a day’s work. Last week I took Friday off to take advantage of the kids being gone to the grandparents’ house. It’s a good thing they weren’t here, as I might have accidentally thrown them out in the midst of my purge. Oh no. Under the stairs. I wonder what’s down there? Yeah, it was pretty much what I expected. Some of the things I already knew about: there were baby and kid clothes, holiday decorations and toys. As I dug deep, I found a couple of boxes filled with nothing but empty DVD cases for all the movies we’ve purchased. I tend to store the DVDs in a portable mega case, but kept the individual DVD cases to “help retain the resell value” when the time came to get rid of them. Of course, that never happened. And there I was, stuck with all these cases and a decision to be made. I decided to recycle all the DVD cases. We’d keep all the movies until they rotted or broke or whatever. If all else failed, I could make frisbees out of them or something. I will admit I was sightly overwhelmed at first. I had to call a friend for a little pep talk to get me started. Once I got under way, I became a madman. I took pictures or “scanned” the things I wanted to keep. I chucked things I had held onto for years that hadn’t seen the outside of boxes in forever. My sentimental attachment dissipated. And the things I needed input on from my wife, I grabbed her, sat her down, and had her go through those things with me so I knew I wasn’t getting rid of anything important. 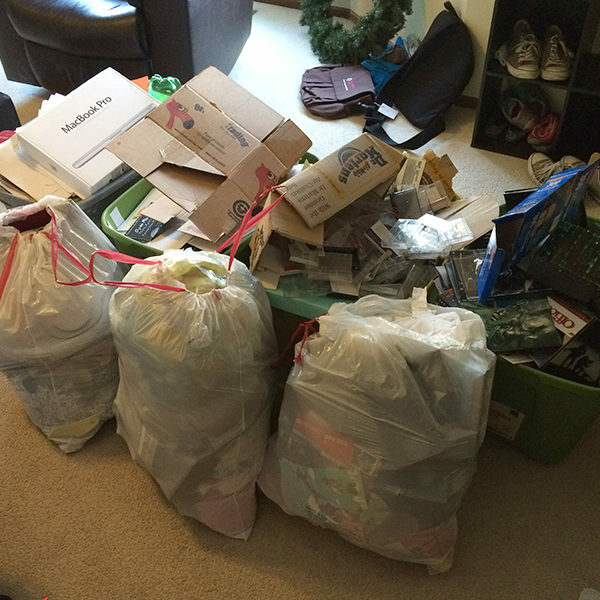 In the end, we had three bags of trash and four bins of recycled materials exit the house. Our trash and recycling containers are filled to the brim now, so I’m kind of in a holding pattern for a few days until they get emptied. I loaded up the back of the van with items to donate, which either went to Goodwill or to a friend who was going to put them in his garage sale. The purge taught me a few things that I wanted to pass on. I hope you find these helpful. 1. Free up as much space as you can in trash and/or recycling containers. Our refuse is picked up every Wednesday, so filling our trash and recycling containers on Friday kind of boxed us into a corner until trash day. While the recycling was empty, the trash can was about one-third of the way full. Had I to do it over again, I would have sorted my recycling better and taken it to one of the recycling centers we have in town so I’d still have room for household recycling. I’m unsure what I could have done about the trash, however. Sometimes you just have a lot to throw out. 2. If you need input from a partner about your stuff, then go get your partner! Several of the items I got rid of I had put off for a long time because I wasn’t sure if I should keep or pitch them. The lightbulb moment for me came when I realized I needed my wife’s guidance, and made myself, right then, to go ask her to sit down with me to make progress. 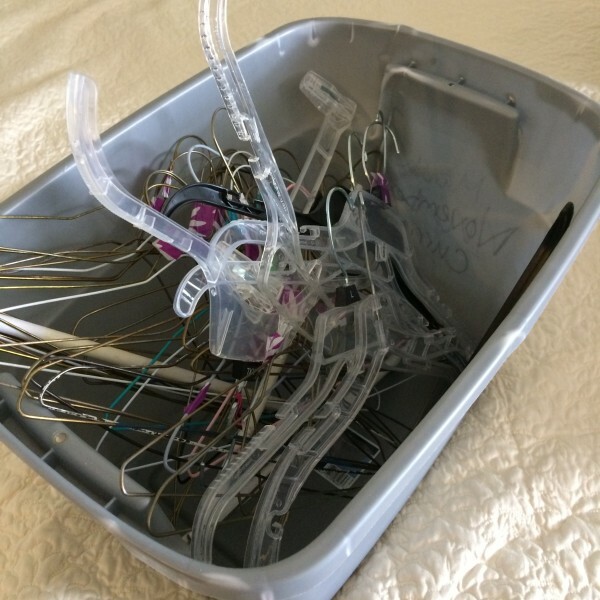 This was incredibly helpful, as there was much that needed to go, but a few other things she wanted to keep that I might have otherwise thrown out. By devoting a little time with her, I was happy with the decision we made together and didn’t think anything we got rid of was a mistake. 4. It’s OK if you don’t get through everything in one setting. I have three boxes of pictures that I don’t want to get rid of, but I would like to keep. I’m working on some options for turning old film prints into digital so I can keep them in my hard drive and external backups. This is going to take time. I realized early on that it wasn’t going to all get done in one day, and accepted it. I weeded out a few photographs I absolutely knew I didn’t want to keep and then stored the rest in a plastic storage container for processing later. And really, you’ll get to a point where you need to stop the process and enjoy your life. There will be time for future edits — pace yourself. I’m go glad I took a day off of work for this. When we were done (for the time being) I reveled in what we accomplished. I’m really starting to enjoy the freedom of having fewer possessions. It gives me some satisfaction to know that in the event of a weather emergency like a tornado, we’ll now have room to get under the stairs in the basement. Perhaps most important, I found it easier to let go of things that I thought I needed to keep, but clearly weren’t that important or else I would have used them. The really odd part? I wonder just how deep this rabbit hole goes. How much can I get rid of? Were will it end? What is the endgame? I guess we’ll just have to see. I’m excited for the possibilities. This entry was posted in Recycled, Trashed on July 29, 2014 by ericjgruber. Four drawers, two cabinets, almost nothing of value. 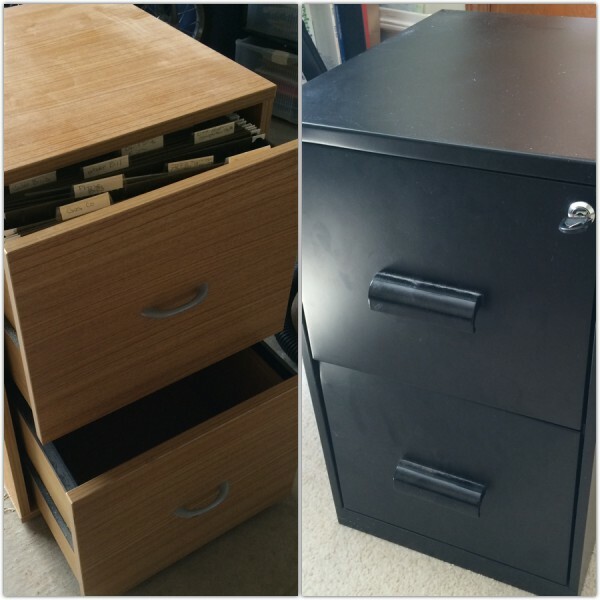 Recently I rid my house of two filing cabinets. The brown filing cabinet has been sitting in our garage since we moved in May of 2010. Number of times it was accessed: zero. When I took an hour and went through it last week, I was amazed and slightly saddened by how useless the papers were that were in it. Most of the papers were old product manuals for a lot of things we don’t own anymore, and haven’t owned in years. Toasters, iron, DVD player, and video camera manuals were just a few of the many I found. I guess that filing cabinet became the de facto storage unit for those unread manuals. The rest of that cabinet was old insurance papers, old credit card statements, old … everything. It was mostly worthless. I sold this cabinet for $20. The black filing cabinet has gotten much more use over the years, but not by much. For the most part, it’s served as a resting place for our computer printer near my desk. I also have a bookshelf near the desk that isn’t too tall, so I cleaned off the top of it and put the printer on top. There were a few things of value to us in the black cabinet, but after some editing those items were paired down and stored in a small plastic container in the closet. I was going to sell this cabinet, but when I went to pick it up I accidentally broke it. I stuck it to the curb and it mysteriously disappeared within an hour. I’m glad I was able to get rid of these two items. They probably took up 10 cubic feet of storage space, and now they’re gone. I can’t wait to see what I can get rid of next. This entry was posted in Reused, Sold on July 17, 2014 by ericjgruber. Look at this mess. Don’t judge me too hard, as I’m just getting started. My progress in the garage is finally getting some momentum. As you can see from the picture, I’ve got several big items to take care of. There’s quite a bit of work ahead of me. Buried in here was a filing cabinet filled with a bunch of really old papers, and I got to tackle that last night. It’s amazing the things I found in there! I found a huge stack of manuals for a lot of things we don’t even have anymore, so I recycled them along with several old magazines. There was plenty to throw away as well, and I eventually got the papers I needed to go over more carefully down to a shoebox-sized stack. There were some things that were very easy to get rid of once I took a good look. Old insurance papers, bills of sale for a car we no longer own, and retirement information that’s worthless were easily shred. Plus, some of that had our personal information on it that should be secured anyway, so taking those to the shredder was a necessity. But there were some things I didn’t want to get rid of just yet, but since they were on paper it didn’t seem necessary to keep them. This is where technology becomes a welcome adversary in the war against stuff. I have an app called Scanner Pro on my mobile devices. With this app, I can take pictures of documents, and it will convert them to low-resolution PDFs. The app has a feature that allows you to hook it up to online storage like Dropbox or Google Drive. When I’m done “scanning” the documents with my device, the app automatically uploads the PDFs of those items to my Google Drive. Then I tossed or shredded the papers I scanned. Want to have your cake and eat it too? Let technology help you keep your analog gems without getting rid of them completely. Then when it’s time to clean out your digital life, that will be just a few clicks away. This entry was posted in Tips on July 3, 2014 by ericjgruber. A box of letters from an old flame has no place in my life. Think you might like to read. But they’re all addressed to me. All this week I have been on vacation, and the days have been filled with finding staycation things for the family to do coupled with several projects I have long needed to get done around the house. I came across a box yesterday while working in the garage. 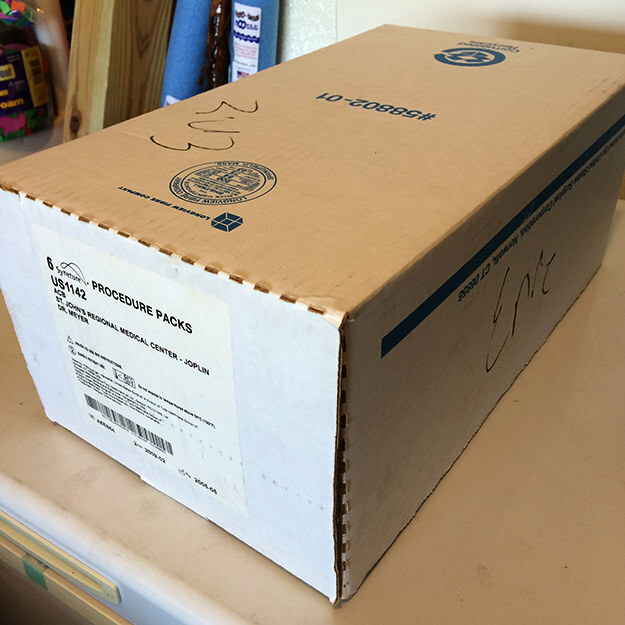 It was not just any old box; it was the box. It was a box full of letters from an old relationship, which was a painful one that didn’t end well. I had forgotten it even existed until I started this minimalism journey. I went looking for it at the end of May, but didn’t find it. Then, while I was packing up for a family camping trip, there it was. When I first went looking for it last month, my purpose was to throw it out the night before trash day so that it wouldn’t be “discovered.” It’s not that I was ashamed of it, and I wasn’t really hiding it. I simply didn’t want to answer any questions about it. So what did I do? I told my wife about it anyway. It led to a good discussion about it, past relationships, and the pain of being with the wrong person. She asked me why I had kept it. Was I over her? Yes, I was long over her. I then explained that I had given it some thought and came up with the only honest answer I could: I kept the box all these years because it came at such a great cost. And so, when I found it yesterday, I got excited. I was ready to get rid of it, and I knew just how to do it. I packed it up when our camping supplies, and when it was time to make supper last night, we used it to light the fire. We made brats and hot dogs, with a savory hint of printer ink and old tears. I will admit that my sentimentality could have tripped me up. I almost looked them over once more as a final review of the evidence. I didn’t. I realized there was no need to rehash old pain. My heart isn’t broken any longer. I’m good. I can only re-state my driver with minimalism: If something no longer adds value to my life, it needs to go. That box and its contents certainly had no value to me anymore, and so, I have one less box in my life. 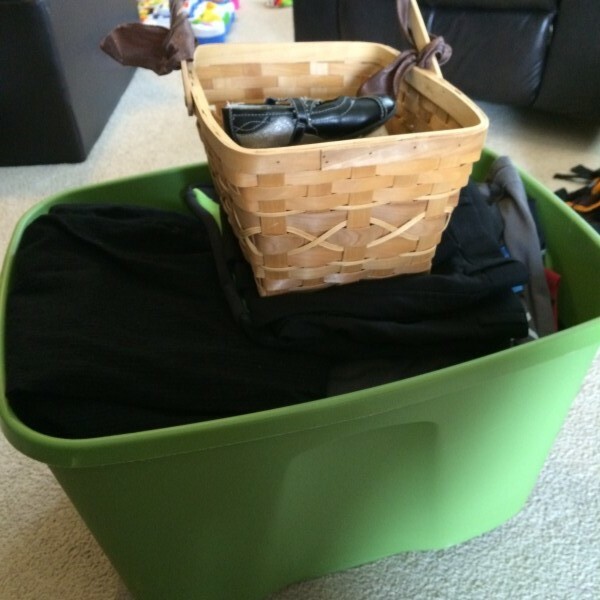 This entry was posted in Trashed on June 27, 2014 by ericjgruber. Image courtesy of La Quinta, which means I lifted it from the company’s website. Last week I traveled to Austin, Texas, for a weeklong conference. I stayed at a hotel, which reminded me of one of the things I love so much about a hotel stay. 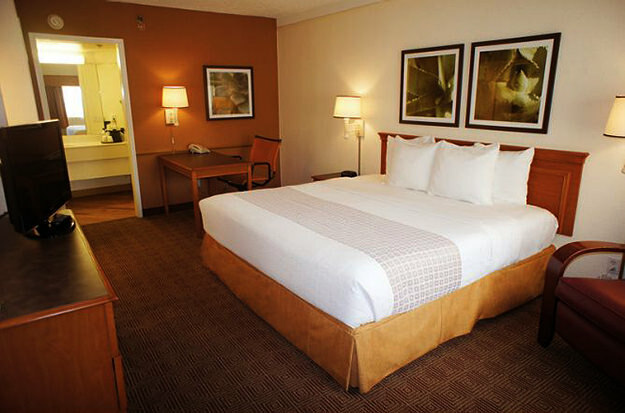 The beauty of a hotel room is it forces you into a state of temporary minimalism. I traveled with only three bags: one backpack for the entire conference that held my computer and other needed gear, one duffle bag with my workout clothes, and my favorite travel bag (instead of a suitcase) the Tom Bihn Aeronaut. I quickly learned I had packed too much. My intentions of working out were just that: between the Texas heat, the large number of steps I took each day at the conference, and having my time gobbled up with all the educational sessions, I simply didn’t have the energy to put in some extra miles. In addition, I determined I could have packed my travel bag a little lighter. In the closet was a plastic bag that I could have used for laundry service for a few extra dollars. Had I to do it over again, I would have had the hotel wash my clothes a couple of days into the trip rather than bringing multiple changes. My hotel room looked much like the one pictured above. It had a comfy chair to relax in, a bed, a desk to do some work at, a dresser, closet, and a bathroom. There was even a tiny fridge and microwave. The TV was the only real luxury in the room, but it was nice to have. The first channel on the TV had a computer generated image of the ocean with sounds of waves playing in the background. I would turn it on and fall asleep to that almost every night. All of that was enough. It wasn’t too much, and it wasn’t too little, it was enough. At home, we’re still plowing away on our journey toward minimalism. 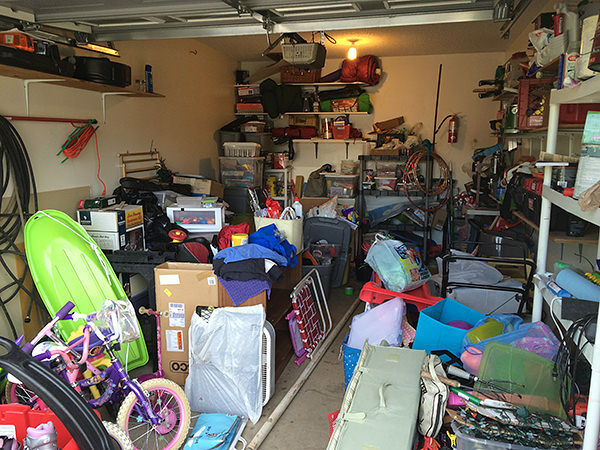 I’ve been systematically working my way through the garage — easily one of the worst offenders to minimalism in our home — with the goal of having a garage sale in early August after we’ve sorted through all we own. I’m excited to see how we end up at the end of the summer. I predict good things to come. But I keep thinking back to that hotel room. Why own more than that? I feel calm and stable in environments with less, so why have more? It is difficult for me to pare down. I find it very challenging. But when I see what the other side might look like, and how it makes me feel, I have hope. This entry was posted in Thoughts on June 13, 2014 by ericjgruber. To celebrate, I was with family after returning from a weeklong work trip. Most of the celebrations happened on Saturday. I took a nap. I swam in the pool at my mom and dad’s house with my daughters and nephew. We followed that up with a fantastic supper. And yes, there were gifts. What do you get someone who’s shedding his things? Easy — only the things he would find value in. I got some money (always accepted), Diet Mountain Dew and Dunkin Donuts coffee (which are great because they’ll disappear when I’m done with them) and some wonderful, handmade items from my daughters and nephew. Those are excellent gifts, because I can always take a picture of them and keep the spirit of those gifts forever. I also got some bacon-themed t-shirts, a total win. And I even got an electric hand sander, which I’ve written about elsewhere. That will have incredible value to me soon as I begin work on a bunk bed for my daughters. Minimalism doesn’t mean you never get another thing, but it does mean that you make sure the things you let into your life have value to you. I am so honored that every single gift I received this year was something I could find value in. It’s as though the gift-givers were listening to me and tailoring those gifts to match who I am becoming. This entry was posted in Thoughts on June 8, 2014 by ericjgruber.